Lock in a great price for Anantara Sir Bani Yas Island Al Yamm Villa Resort – rated 8.8 by recent guests! 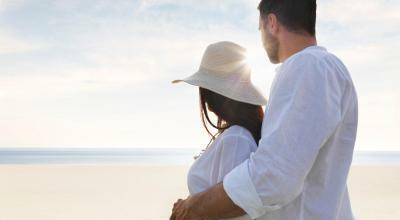 The island is just the perfect getaway from city life , it is definitely the place you want to stay with your family. 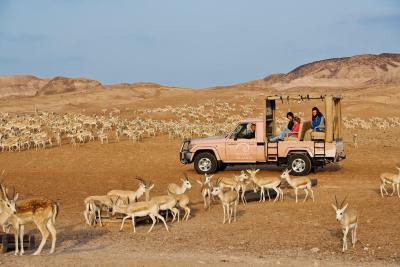 Enjoyed the safari trip and saw different species of the island. If you’ve got the time I’d recommend you to stay for more than 2 days! worth it! The location was amazing. Staff were super helpful, though sometimes a bit unprofessional. It was lovely interacting with animals and being in nature. Fantastic staff, people at the hotel took real care of the guests. 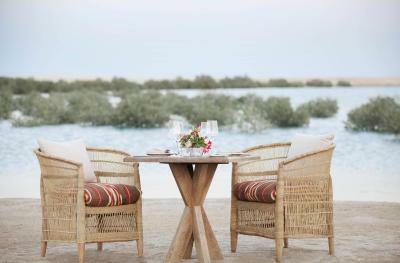 We enjoyed our stay at Al Yamm very much. The beach is a bit rocky (and has dead Corel and shells) so you need to wear shoes . 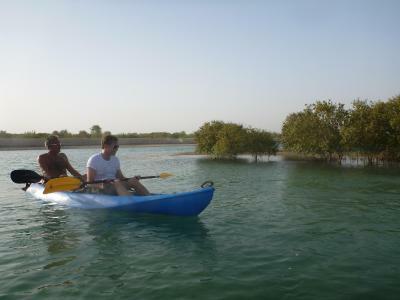 But overall the island is remote and quiet, a very nice experience in order to get away from the city. The staff and the nice room are the best things about the hotel. We were looking for a secluded place and that’s what we found (if you’re looking for nightlife don’t go there). 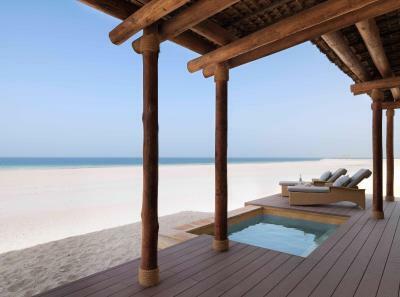 It is amazing to ear just the birds singing when you are looking at the sea seating outside your villa, watching the antílopes or the peacocks walking around. The island itself it’s something astounding and a tribute to what man can do. 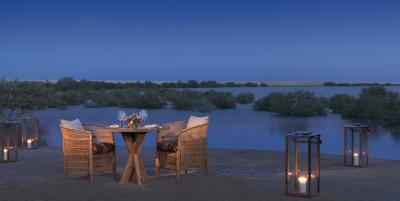 The weekend at Anantara Sir Bani Yas Island was the best experience I have ever had in UAE in a resort outside Dubai. The service is outstanding, staff very friendly and helpful. Villas are awesome and very clean! From the first hours we felt like at home with a lot of space for privacy. Special thanks to Jenen, Moath, Thomas and Ryan for making my birthday and time at the resort very special! the staff are exceptionally helpful and go out of their way for your comfort. Savannah restaurant (African Restaurant) is beyond fantastic. 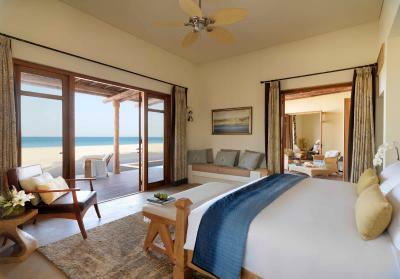 Anantara Sir Bani Yas Island Al Yamm Villa Resort This rating is a reflection of how the property compares to the industry standard when it comes to price, facilities and services available. It's based on a self-evaluation by the property. Use this rating to help choose your stay! 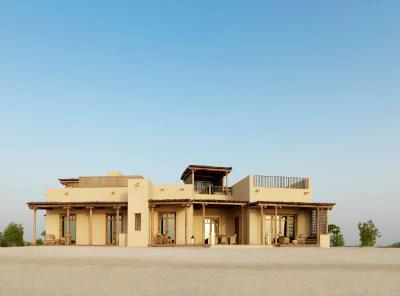 Located on the beachfront of Sir Bani Yas Island, this property offers a serene atmosphere with views of the sea or mangroves. 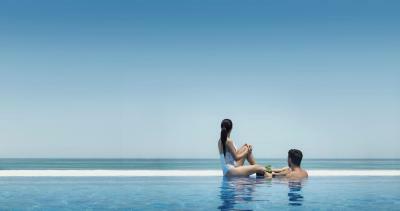 It includes free private beach, fitness center and Wi-Fi in all areas. 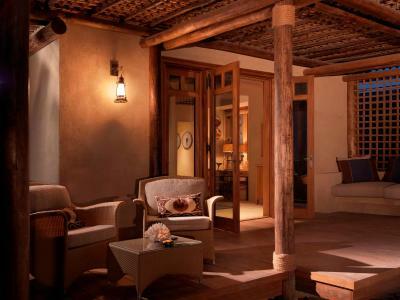 The Anantara Spa is available at an added cost. 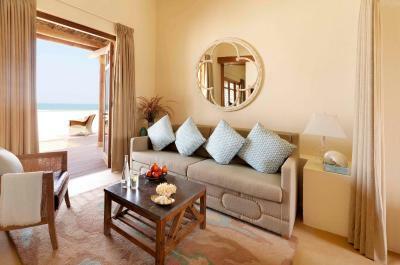 The air-conditioned villas are decorated in soft tones and fitted with wooden furniture. 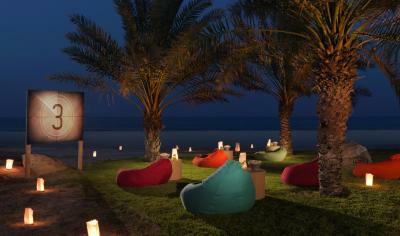 It features a seating area with a flat-screen TV, and a terrace that overlooks the sea or mangroves. 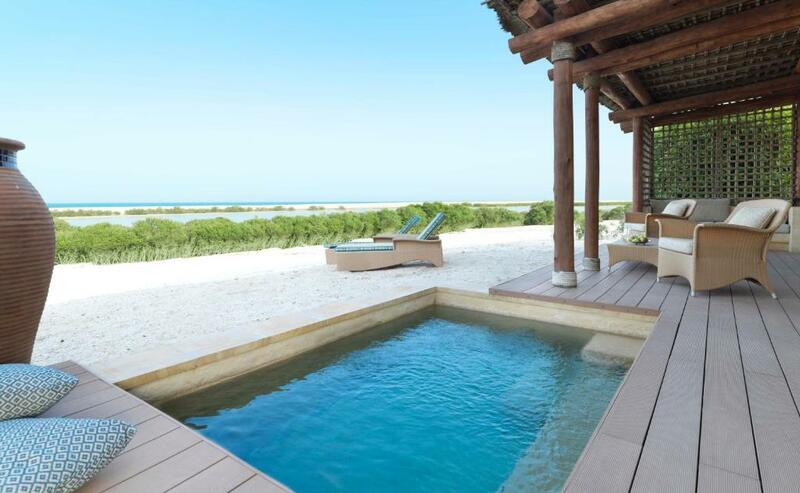 Some villas include a private pool. 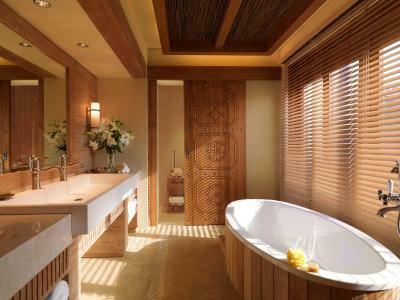 A shower and bath are included in the bathroom. 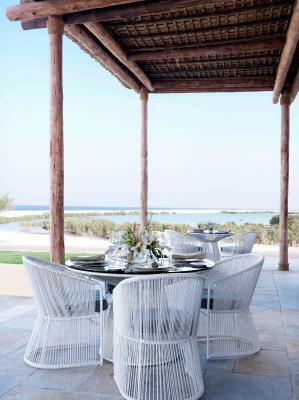 Anantara Sir Bani Yas Island Al Yamm Villa Resort features Olio that serves an Italian inspired cuisine throughout the day. 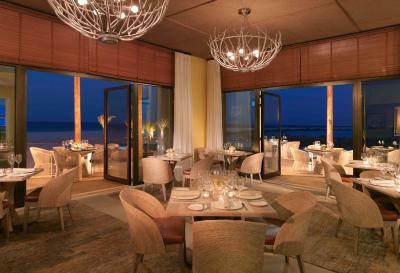 There are additional dining choices available for guests at sister resorts nearby. 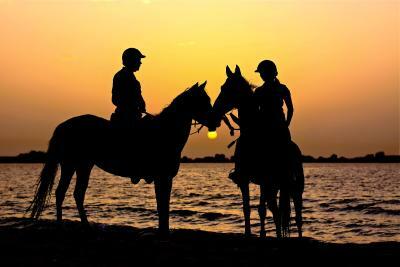 Guests can enjoy recreational facilities such as snorkeling, horse riding and hiking at an added cost. 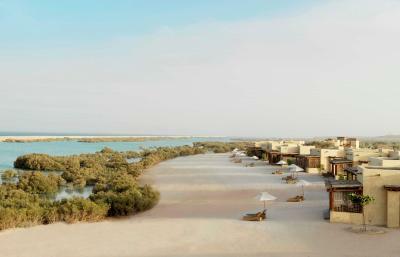 Abu Dhabi International Airport is 155 mi from the resort. 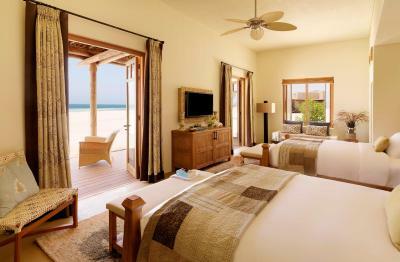 When would you like to stay at Anantara Sir Bani Yas Island Al Yamm Villa Resort? 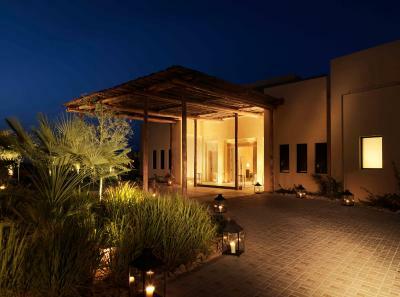 Featuring a private entrance, this modern, air-conditioned villa offers a terrace overlooking the mangroves. It comes with a sofa, coffee and tea making facilities, flat-screen TV, a desk and a wardrobe. 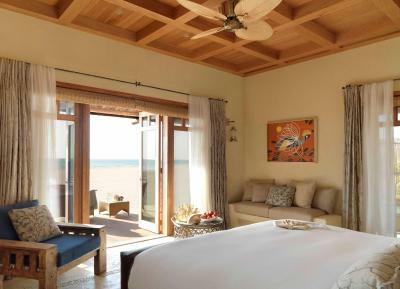 Please note that the villa offers a king or a twin bed. 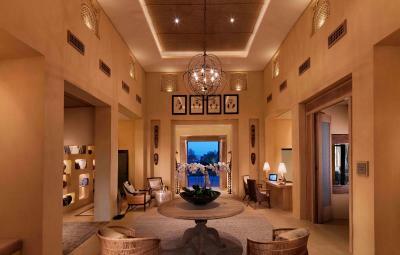 Please note that this villa can accommodate 2 adults. 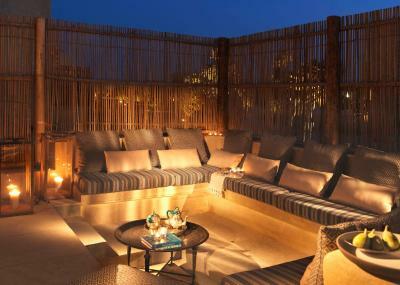 Featuring a private pool, this modern, air-conditioned villa offers a terrace overlooking the mangroves. It comes with a sofa, coffee and tea making facilities, flat-screen TV, a desk and a wardrobe. Please note that this villa can accommodate 2 adults + 1 infant up to 4 years old in an existing bed + 1 child up to 11 years old in a sofa bed. 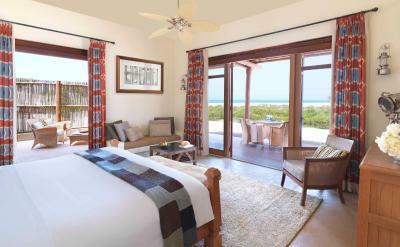 Featuring a private pool, this spacious, air-conditioned villa offers a terrace overlooking the sea or the mangroves. It includes a living room with sofa and a dining space. It also comes with a flat-screen TV, a desk and a wardrobe. A bath, a shower and free toiletries are fitted in the bathroom. 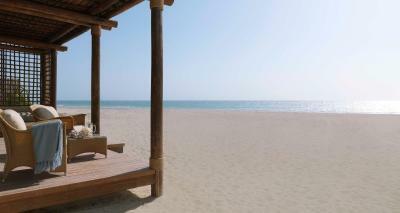 Located on the beach, this modern, air-conditioned villa offers a terrace overlooking the sea. It comes with a sofa, coffee and tea making facilities, flat-screen TV, a desk and a wardrobe. 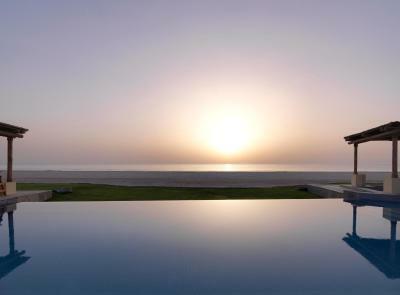 Featuring a private pool, this modern, air-conditioned villa offers a terrace overlooking the sea. It comes with a sofa, coffee and tea making facilities, flat-screen TV, a desk and a wardrobe. 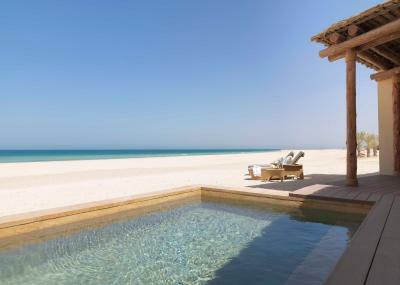 Al Yamm Villas is a beach side haven inspired by the simplicity of a traditional fisherman village. 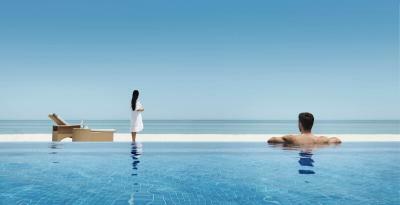 Choose from luxurious villas with either beachfront or lagoon vistas and experience a unique blend, combining natural beauty with modern day luxury. 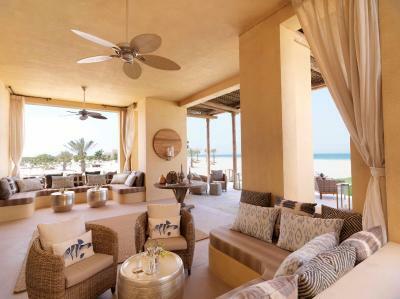 House Rules Anantara Sir Bani Yas Island Al Yamm Villa Resort takes special requests – add in the next step! 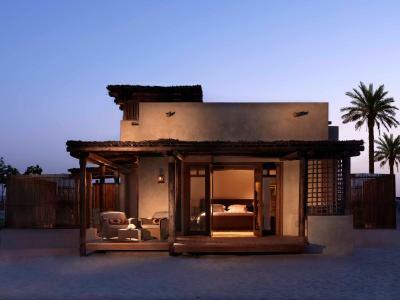 Anantara Sir Bani Yas Island Al Yamm Villa Resort accepts these cards and reserves the right to temporarily hold an amount prior to arrival. 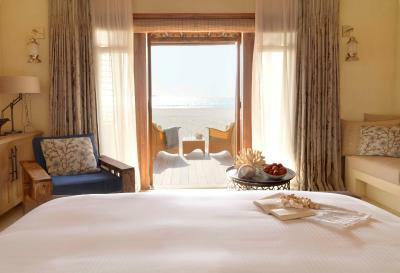 Please note that, there is a AED 20 Island logistic fee per room per day will be charged directly at the property. Please note the credit card used for booking should be present at the time of check in. 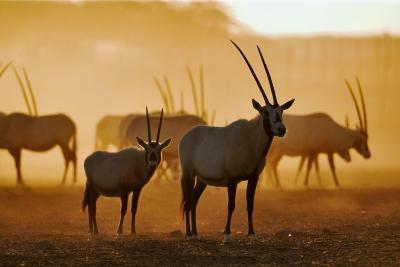 Please inform Anantara Sir Bani Yas Island Al Yamm Villa Resort of your expected arrival time in advance. You can use the Special Requests box when booking, or contact the property directly using the contact details in your confirmation. - Staff is super friendly but not really to level for a 5 stars establishment. - Staff ringing at the door in the evening even when "do not disturb" sign is on the door - Glasses/ cutlery not changed in the room - I understand that the hotel is on an island and that everything is is more expensive and I am fine with it.... but 30aed for an americano coffee that takes 30min to be ready without crowd to justify the time it takes, the value for money is not there. transfer between land and island , unlesa if you arrive 15 mins of departure. Green newby staff at arrival, Thilini. Very incompetent, inexperienced and unintelligent. Provided for very frustrating experience throughout. He rang the room about 6 times in the first 20 min of our arrival with a whole series of nonsensical and unimportant questions. The property should always have a manager on staff. Few other staff members were also unhelpful. Overall Staff quality is much to be desired. Another issue. Incidental small costs. And small mindedness about it. Charging for items in the fridge. $10 for nuts. As we check out. Really? After paying $4,000 for 2 nights, with food? Charging for ferry transport $10, as a separate charge. Really? The charge should be included in the overall price. The room was very dated and unclean. There was a water leak when we arrived. The furniture in the room was too big and in the way for the size. Many small but important nuances are missed. Like hooks to hang towels and robes on. Or hooks to hook the outdoor doors in place, to allow for fresh air without the banging doors. Transport from and to the ferry is painful. With many stops and unpacking and packing and all over again. The property needs to think through a more seamless experience in that regard. Overall, for the price we paid - $4,000 with food - rather unimpressed and disappointed. Liked the beach and the view. Food at the Italian restaurant was good. The main pool and the plunge pools were great. Safari adventure were very nice. 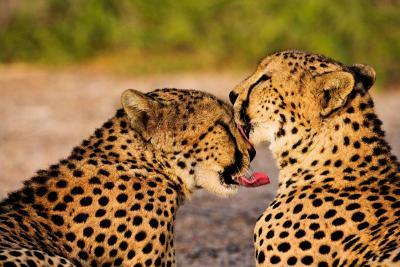 Safari staff was very competent, Marlene, in particular. The staff at the pool were attentive. The property grounds were lovely. Friendly and attentive staff. Location. All this comes at a price. 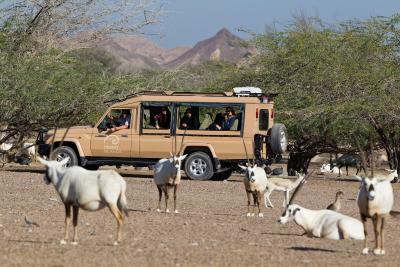 Sir Bani Yas is definitely an expensive location, but that's expected due to huge cost of running the whole thing. So more like a precaution, than a complaint. A unique place with a different vibe. 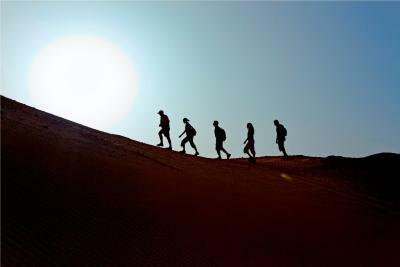 We've enjoyed our villa, amazing and helpful staff, our safari trip and a very nice Arabian dinner next to a big bonfire. Loved it! The food was not good, the bed was very uncomfortable. The room lets in so much light in the morning, making it difficult to sleep in. Food was highly overpriced. The "pool" was too small and hardly fit 2 people, I was shocked to have to pay extra for it. The quality of the beach was a little below expectation. For this price a was expected a set up on the beatch for swimming in the sea ( long chair, towel, umbrella), nothing was there , for this standing not acceptable ! Just a ridiculous small pool !